Theme: THE STORY OF MANKIND: The Pre-Historic Age explores the early developments of humanity. Draw strength from the examples of early man as you witness the human spirit and will in action. • 2 month(s) course fee and $9.90 admin fee payable upon registration. Receive up to BM$17 by attending this module. BM$ can be used to offset future course fee payments. I enjoyed my Ukulele class. It is fun and enriching. Thanks Coach, for making the theory easily understood. ii) Wish to establish a proper foundation with chord theory and strumming consistency. This will help you to develop your playing further. We accept registrations from ages 8 and above. We will channel students to classes of compatible age groups whenever possible. Individuals who attended courses elsewhere but are still unable to play confidently and effectively are advised to join this Level I Module. Using a superior syllabus along with solid instruction from Believer Music coaches you will be playing well very soon. What do I learn in 2 months? Conducted in small groups (i.e. 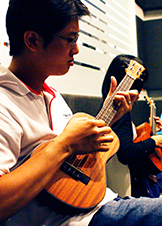 6-8 persons), the 1 hr per week sessions include: INTRODUCTION to the ukulele and its role, essential RHYTHM fundamentals, CHORD theory and formations, SONG APPLICATION with familiar songs. I received Guitar lessons on previously. Is it still applicable in this course? Yes, your experience playing the Guitar is applicable because you have learnt to listen to yourself as you play and follow general timing as you play with strumming rhythms. Here, you will learn how to handle the smaller instrument(Ukulele) and add greater variety to strumming styles. You will be able to decide the most appropriate rhythm to use as well as play the song in more than one fashion. The course also challenges you to form creative chord variations for your songs. Do I have to bring my Ukulele around? Is it convenient? All Training Rooms are fully equipped with practice guitars. Our Training Centres are conveniently located at either International Plaza - Flagship (beside Tanjong Pagar MRT station) or One Commonwealth (beside Commonwealth MRT station). You'll get to meet people who share the same passion. Learning to play a musical instrument is highly rewarding because it leads to growth in a music-spiritual dimension. Learning to play the guitar is more than fun. It's life changing. We all know of people around us whom we think have successfully learnt to play the guitar reasonably well. With practice, this skill will stay and enrich not only your lives but also the lives of people and family around you (and generations to come). For many of us who are just starting to pick up this unique skill, believe that the journey is well worth it.